I use enamels over modeling paste so that the enamel does not get sucked away into the surface opening up enormous development opportunities. Resins create a sense of depth rendering the surface three-dimensional. The relation between experimentation and emotional process involved in the creation of the work is well represented from the overall outcome. Vulcan/Rage, is about using experimentation to represent strong forces and express emotions. 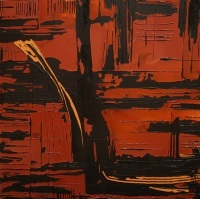 In this work the addition of dry pigments in some area of the matt black gesso helps to create contrast among surfaces. The emotional gesture used to apply the media creates a sense of calm, but powerful chaos. 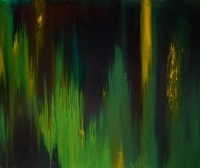 In Tropical Storm/Relief, by using dry pigments over stand oil and letting the oil absorb the pigments and slowly run along the canvas I recreated the ‘emotion’ of rain over the forest. This painting recreates a calm deep feeling of relief. 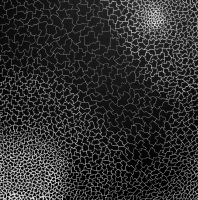 For Drought/Drained, the use of only black over white and the variable distance of the black spots gives the painting an illusion of perspective while recalling the image of dry soil. 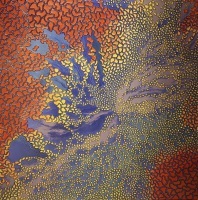 The thick over layer of resin gives three-dimensionality to the image and an illusion of depth between the black spots (unfortunately much of the texture and 3-dimensionality of the painting is not visible in the photo). Creating this painting required hundreds of hours of work leaving me emotionally drained. 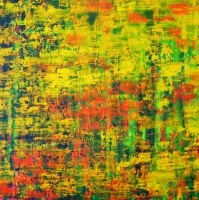 The warmness of the yellow and orange in Heat Wave/Passion, together with the texture created by overlapping layers of thick oil color, infuse an overwhelming wave of hot air over the green background, much as passion creates a feeling of heat that surges through the body.